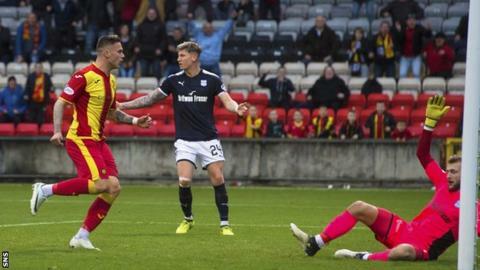 Miles Storey scored his first goal for Partick Thistle as they fought back to beat Dundee and seal their first Premiership win of the season. The Englishman netted two minutes into stoppage time from Kris Doolan's low cross to keep the points in Maryhill. A-Jay Leitch-Smith's diving header had given Dundee the lead but he later had a penalty saved by Tomas Cerny. Ryan Edwards was well placed to equalise for the Jags before Storey's dramatic winner. Thistle's first league win in 16 attempts relieves the pressure somewhat on Alan Archibald as his side move level on points with second bottom Kilmarnock, who are not playing this weekend. Dundee slip to ninth, two points above the bottom two. Dundee looked on top in the first half and it was immediately evident why manager Neil McCann placed so much trust in the relatively unknown Australian winger Jesse Curran. Within four minutes the 21-year-old had created two great chances after inventive skill down the right-hand side. Leitch-Smith watched his low effort repelled by Cerny before Sofien Moussa headed over. At the other end, Dundee goalkeeper Scott Bain reacted well to deny Danny Devine at the back post, but it was the hosts who looked more vulnerable defensively and the Dark Blues exploited that. Glen Kamara's mazy, roaming run began a move that looked to have ended with Niall Keown clearing off the line from Moussa in the nick of time, yet Kevin Holt was quickest to the loose ball and delivered a low cross for Leitch-Smith to stoop and convert. Thistle nearly grabbed a quick equaliser when Edwards' speculative chip landed on the roof of the net. Moussa almost turned in Lewis Spence's dragged effort before Dundee got an even clearer opportunity to extend their lead - the menacing Leitch-Smith clattered in the box by Cerny, who made amends by saving well from Leitch-Smith with his boot to send the ball high and away. Despite his penalty miss, Leitch-Smith continued to look full of mischief and had three attempts early in the second half which were either blocked or wayward. Archibald - the Premiership's longest serving manager - brought on Storey, Blair Spittal and Doolan to try and increase potency. Storey was presented with a decent chance to level when former Dundee right-back Paul McGinn dispossessed Holt, but Storey's poked shot was deflected wide for a corner. But the equaliser came. McGinn and Doolan had sent shots goalwards that Bain failed to hold and Edwards was on hand to smash home from 10 yards - the Australian's second of the season. Moussa was culpable for a glaring miss soon after when the Tunisian could not connect properly with Roarie Deacon's nice lay-off. Deacon then claimed unsuccessfully for a penalty before the dramatic finale. Storey raced into the box to meet Doolan's low delivery and spark amazing scenes of celebration from players and home fans alike. Partick Thistle assistant manager Scott Paterson: "It's a happy dressing room, it's one of relief. "It was a very tough game, tough 90 minutes, but I think the players showed a lot of character to come through that. "Hopefully, we can go and build on this now for Tuesday night, next game against Hamilton." Dundee manager Neil McCann: "There's frustration and a lot of anger because we should be putting teams away when we are so far ahead of them performance-wise. "I've seen the best players in the world miss penalties. That can happen. "But we've been very wasteful in a lot of games. If you don't take chances, the door's always open and we get hit with a sucker-punch when we're pushing forward trying to win the match. "The problem is Miles [Storey] is miles offside. He becomes alive in the second phase and because of that our boys can't get back to him. "We let ourselves down massively today. If we are clinical at home on Wednesday [against Motherwell] then I have no doubt we'll get the three points." Match ends, Partick Thistle 2, Dundee 1. Second Half ends, Partick Thistle 2, Dundee 1. Goal! Partick Thistle 2, Dundee 1. Miles Storey (Partick Thistle) right footed shot from very close range to the centre of the goal. Assisted by Kris Doolan. Niall Keown (Partick Thistle) is shown the yellow card for a bad foul. Foul by Niall Keown (Partick Thistle). Kevin Holt (Dundee) wins a free kick on the left wing. Mark O'Hara (Dundee) wins a free kick on the left wing. Substitution, Dundee. Faissal El Bakhtaoui replaces Sofien Moussa. Attempt missed. Mark O'Hara (Dundee) right footed shot from outside the box is too high. Ryan Edwards (Partick Thistle) is shown the yellow card for a bad foul. Attempt saved. Sofien Moussa (Dundee) left footed shot from very close range is saved in the centre of the goal. Goal! Partick Thistle 1, Dundee 1. Ryan Edwards (Partick Thistle) left footed shot from very close range to the bottom left corner. Attempt missed. Jesse Curran (Dundee) right footed shot from the right side of the box misses to the left. Attempt blocked. Danny Devine (Partick Thistle) header from the centre of the box is blocked. Corner, Partick Thistle. Conceded by Josh Meekings. Attempt saved. Roarie Deacon (Dundee) right footed shot from outside the box is saved in the centre of the goal. Substitution, Dundee. Mark O'Hara replaces A-Jay Leitch-Smith. Corner, Partick Thistle. Conceded by Sofien Moussa. Corner, Partick Thistle. Conceded by Darren O'Dea. Substitution, Partick Thistle. Blair Spittal replaces Chris Erskine. Hand ball by Conor Sammon (Partick Thistle). Roarie Deacon (Dundee) is shown the yellow card for a bad foul. Foul by Roarie Deacon (Dundee). Sofien Moussa (Dundee) wins a free kick on the left wing. Lewis Spence (Dundee) wins a free kick in the attacking half.